One of my favourite bits of technology in Star Trek is the “Replicator,” a big grey box that can materialize any object you tell it to. Its most common use in the show is for food and water. Listen, I love cooking; there are fewer things more relaxing than putting on some tunes and crafting a meal alone, and even fewer more gratifying than doing the same with friends. I’m also a firm believer in the idea that food tastes better when you make it with your own hands. But I’m a busy guy, and don’t often have the time to spend in the kitchen. As such, my diet consists mainly of hastily made pasta, sandwiches, and salads. It’s possible that I’d overuse a machine that could make me sushi every night, but it’d certainly be more convenient. The automated kitchen will supposedly be able to make about 2,000 dishes. 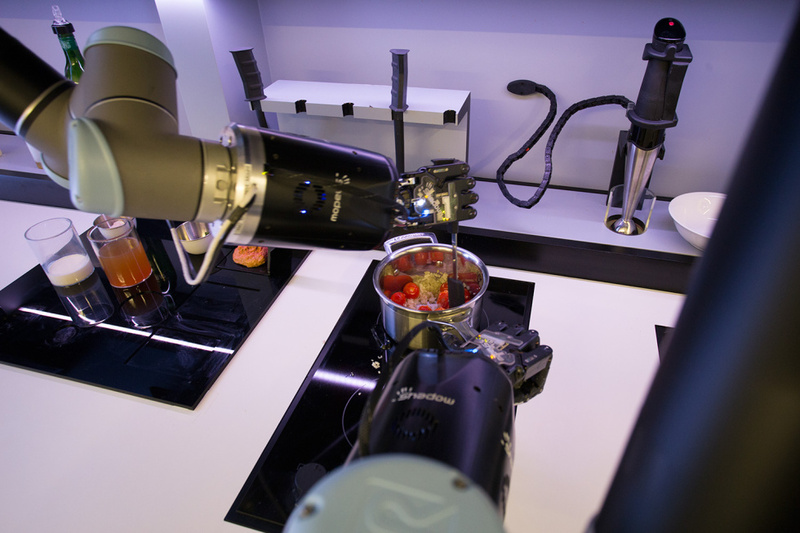 What’s perhaps most interesting about the technology is that the hands are not moving based on lines of detailed code per recipe—rather, they mimic a chef’s hands, whose movements have been motion-captured in a replica kitchen and converted into algorithms that the robot arms can understand. That means that you’re not just getting a nondescript version of any given food, but a particular chef’s, as in the recently-disseminated example of a crab bisque made by 2011 Masterchef winner Tim Anderson. So you could be eating Gordon Ramsay’s burger, Alton Brown’s beef stew, Masaharu Morimoto’s sushi. The natural development of all this is the eventual ability to teach the arms yourself, like keeping your grandma’s apple cake in perpetuity. The unit is pricey, with a suggested cost of $15,000, and the crab bisque has been the only dish shown so far, so whether it can reach its 2,000-recipe goal is anyone’s guess. There’s also a surprising lack of detail in regards to the specifics of the automated kitchen’s functionality—for example, how do I direct the arms to the necessary ingredients? And, of course, there’s the wider issue of the higher level of automation keeping us even more disconnected from our food production than we already are. But hey—5-star steaks for everyone, amiright! ?